The Short Version: Your home says a lot about who you are. That’s why it’s important to make sure your walls are showcasing the best side of your personality, and International Poster Gallery can help. 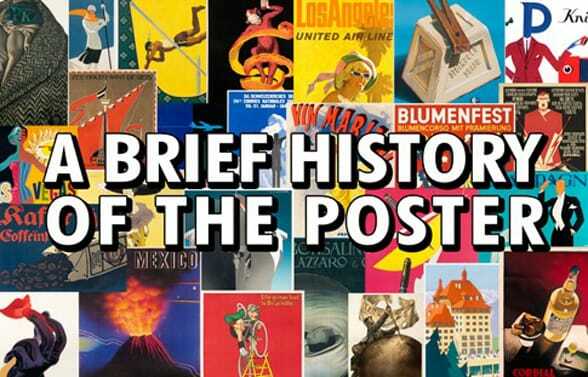 The site is an excellent resource to find unique, historically meaningful posters to decorate your living space. The Gallery’s extensive search features make it simple to find the perfect gem to highlight who you are. With more than 10,000 original pieces from which to choose, International Poster Gallery’s art serves as a great conversation starter or the perfect gift for your special someone. Studies show your home can be a dating dealbreaker. While messiness, funky smells, and dirty sheets may take the cake, poor decorating is also high on the list of dating turnoffs, especially among women. In fact, women cite ugly or inappropriate artwork as the second-most off-putting interior design no-no. Not everyone has an eye for design, and seeing work by the masters go for millions of dollars can make hanging compelling art on your walls seem unattainable. But neither of these barriers should prevent you from presenting a living space that best reflects your personality and taste. 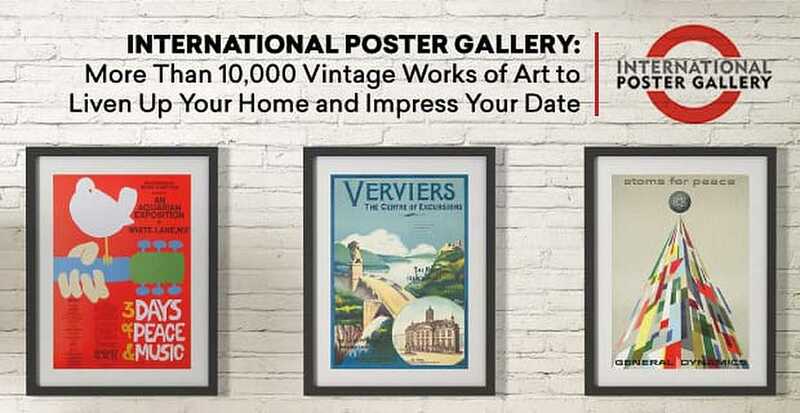 International Poster Gallery features thousands of original posters that can add a bit of sophistication to your dwelling with prices ranging from just a few bucks to thousands of dollars for the more sought after pieces. Show off your personality with the right selection from International Poster Gallery’s vast inventory. The Gallery’s vast storehouse of vintage artwork from all over the world can help you curate a collection sure to impress your dates. Whether you love American Post-WWI pop art, images from Italian operas, or the avant garde, you can find it with the site’s extensive search filters. If you’re looking for good conversation starters, the Gallery dedicates a section of its site to the history of poster art — from its beginnings as woodblocks and metal engravings, to the lithographic process and today’s digital printing techniques. So when you invite that special someone in for the first time, you can discuss the world’s cultural history while he or she soaks in the refined artwork on your walls. Founded by Jim Lapides, the Gallery is an extension of his personal passion for original vintage posters. In business now for more than 23 years, International Poster Gallery has won upward of 100 awards for its diverse content and inventory. Art lovers can visit the Gallery’s physical location in Boston’s Art and Design district in the South End. The Gallery has also received stellar reviews in publications such as The New York Times, The Boston Globe, Worth Magazine, and the Financial Times. And its clientele spans the globe. The organization is respected in the art community and has assisted in curating poster collections for numerous corporations and museums, including the Museum of Modern Art in New York, the Library of Congress, and the Museum of Design in Zurich to name a few. The Gallery’s vast collection of vintage posters are a perfect way to convey your character to your date. Unlike the posters of your teenage years, these works are originals from all over the world and can reflect an appreciation of artistry, culture, and elevated taste to all who visit your home. They are not reproductions but rather antiques — they are leftovers from the original print runs from 1890 to the present. While many galleries are dominated by posters by French artists, the Gallery goes far beyond Paris for its impressive collection. The site offers Italian, Dutch, Russian, and Swiss posters, as well as mid-century modern, travel and avant garde works, among many other genres. The team at International Poster Gallery uses its vast knowledge and global connections to curate its more than 50 exhibitions. So if you’re looking for a historical Italian opera poster, you don’t have to spend years tracking it down — the Gallery does all the legwork. The Gallery offers more than 10,000 posters from many genres and countries around the world. With a simple click, you can search by several categories, including subject, country, period, style, artist, size, and price. You can also expand each subject if you want to browse posters featuring, say, music. This allows you to find that original poster of Yellow Submarine you were looking for, which could be the perfect way to start a conversation with the Beatles fan you’re seeing. You can also enjoy a virtual gallery tour featuring over 10,000 original vintage posters. You no longer need to be in Boston to visit one of the leading antique poster galleries in the world — the slideshow is almost like being there. Not only does the Gallery give you access to amazing original art for your home, but it also offers a fantastic resource to find gifts for your special someone. Perhaps you and your partner have just taken your first big vacation to Barcelona as a couple. It would be a heart-warming surprise to have an original poster of the Spanish city to come home to as a way to mark the moment. International Poster Gallery also gives daters an educational primer in poster art. In the About Poster Art section, novices can learn a brief history of the genre. From there, enthusiasts can choose a particular country, style, and topic to study their area of interest. For instance, cultural devotees can learn how the Art Nouveau movement took inspiration from nature, employing flowing lines meant to mimic the organic shapes found in the environment. Creative daters can find conversation ideas in the Gallery’s section on the history of poster art. The primer gives information on time periods, how the movement looked in different countries, and specific details of the style. It also informs readers of the leading artists of the time and links to past gallery exhibitions. With all of that knowledge, think how exceptional it would be to have a romantic candlelit conversation about the world’s cultural history over twinkling glasses of wine. With a roaring fire or romantic music in the background, you will be able to stoke your date’s intellectual fire. It’s definitely a more memorable occasion than dinner and bowling. International Poster Gallery is devoted to showcasing compelling art in its online gallery exhibitions, which can inspire seasonal or topical decorating ideas. Masterpiece May features famous works from the Art Nouveau, Art Deco, and Modernist movements. Imagine Cycles Gladiator or an original Niklaus Troxler, full of his dynamic and edgy style, greeting guests in your living room. Just paging through each exhibition lets the imagination run wild with ways to elevate your current décor. 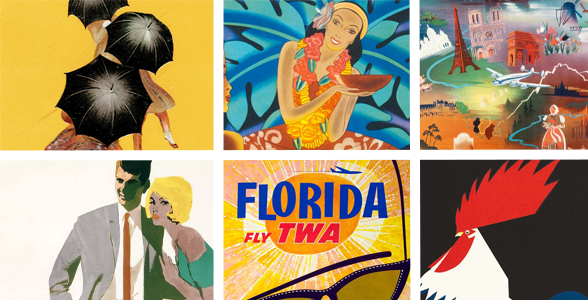 With so many unique styles and countries of origin, the Gallery’s thousands of original vintage posters can display your interests and good taste, and create a home that’s not a dating dealbreaker.